Loving your body is a key element to ending emotional eating. These might not seem connected, but they are. I hear so many people talk about hating their bodies. I hear them say, “I hate my body, I hate how I look.” They have felt this way for years, some even since childhood. This body hatred is a deep pain many of us feel. The pain is based on the idea that our bodies need to be a certain weight (number on the scale) or look in a particular way (slim). 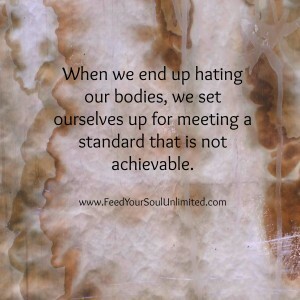 When we end up hating our bodies we set ourselves up for meeting a standard that is not achievable. It takes some work to get rid of these thoughts, but it is doable. As you consider this, what parts of your body do you believe do not meet this standard: belly, arms, abdomen, buttocks, legs or thighs? Scan your body right now for the areas that you dislike, hate, disown, don’t look at, or complain about. We have taken on this negativity about our bodies from family, media, doctors, weight loss clinics, friends, and the negative mental chatter in our heads. Then we begin to believe the negative self-talk, since we hear it so often in our heads. In the end, we own it as our own. I, too, struggle periodically with negative thoughts about my body. Have you, like me, bought into this ideal of how our bodies should look? Well I am here to help you end this negativity. I have specific tips to help you end the negativity about your body. As I always say, first you have to notice, acknowledge, and name the problem. Notice that it does not serve you any more to continue believing the negative thoughts you have about your body: it is not helpful to you. Then notice the negativity and acknowledge that it will not get you to your end goal, which is to end emotional eating. After you have noticed the negative self-talk about your body, now start to affirm the positive about yourself. The affirmations can crowd out those pesky negative thoughts. Think about something positive you can say right now about yourself. It does not have to be a positive statement about your body- just something positive. I like to affirm positives about myself that are true and make me feel good, such as “I am kind,” or “I am loving.” This might be hard to do at first, so I also like to focus on letting go of the negative thoughts I have (this works really well with the negative thoughts we have about our bodies). One technique is to get a piece of paper and write down all the negative thoughts about your body. Get it all out on the paper: all the nasty mean stuff you say to yourself. Then rip it up. Yes, rip it up. Throw it away- get rid of it! Do it as many times for as many days as necessary when those thoughts show up. This is powerful and IT WORKS. Letting go of those thoughts propels you forward to getting into a positive groove. 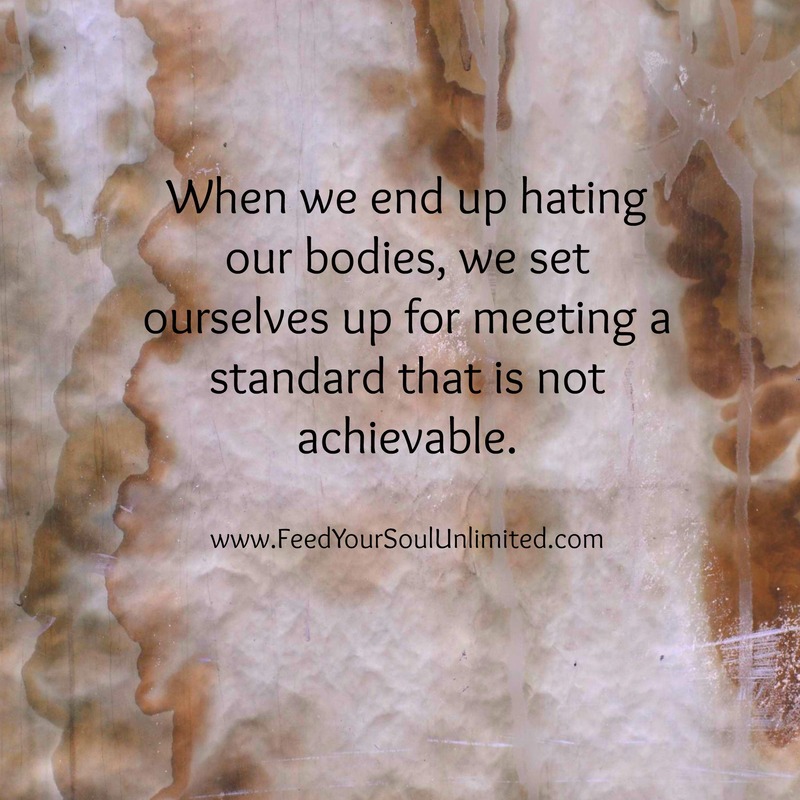 Are you noticing the negative self-talk you engage in, especially those thoughts about your body? Consider the fact that shaming yourself, calling yourself names, or saying negative statements about yourself will not help you end emotional eating AND it will not help you release weight. Give it a go. Tell us in the comments below some positive self-statements you make. Let’s see this transformation.